Delight desserts are one of those old time favorites that everyone has filed away in their recipe box. Chocolate Delight is the most popular, but as a kid I remember it as Striped Delight. Really it's just a four layer dessert consisting of a shortbread cookie crust, chocolate pudding, a sweetened cream cheese filling, and a creamy cool whip topping. Now that I'm all grown up I've made several different versions of this yummy dessert. Chocolate is the most popular, but my personal favorite is Strawberry Delight . Over Easter I made a Lemon version that was a big hit. A couple weeks back we had a grill out and I wanted a simple dessert, so I tried my hand at making a Banana Cream Delight. It turned out just a as delicious as the other versions. I used a banana cream pie pudding mix, fresh banana slices and topped it off with crushed vanilla wafers. 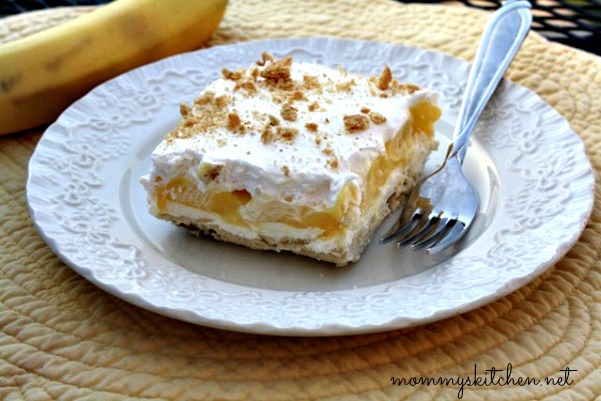 It reminded me of a cross between a banana cream pie and banana pudding. The hardest part about this whole recipe is waiting for it to chill before digging in. I took some step by step photos as I was preparing the banana delight to share with you. This recipe is pretty straight forward, so I don't think you can mess it up. Start by preheating the oven to 350 degree. Prepare crust by adding the butter and flour to a large bowl and blend using a large fork or pasty blender. Add chopped pecans and mix. Press mixture into the bottom of a 8 x8 or 9 x 7 x2 inch pan. If you want a plain shortbread crust just omit the pecans. Bake at 350 degrees for 18-20 minutes or until light golden brown. Remove from oven and let cool. While the crust is cooling prepare the filling. When the crust is completely cooled add the cream cheese filling and spread evenly to the edge. Add a single layer of sliced bananas. Add the banana cream pudding and spread evenly. Top with remaining cool whip. Sprinkle with crushed vanilla wafers evenly over the top. Be sure to seal all edges. Chill for at least 2 - 3 hours before serving. I tell ya it's so hard to wait that long. Enjoy! I had some pretty green mint that I wanted to add to the photo, but a so called basset hound named Sugar Bear dug it out of my planter. I still have yet to find it. Bad doggy! Preheat oven to 350 degree. Prepare crust by adding the butter and flour to a bowl and blend using a large fork or pasty blender. Add chopped pecans and mix. Press mixture into the bottom of a 8 x8 or 9 x 7 x2 inch pan. Bake at 350 degrees for 18-20 minutes or until light golden brown. Remove from oven and let cool. While the crust is cooling prepare the filling. In a large bowl using a kitchen aid mixer or a hand mixer add the softened cream cheese and powdered sugar. Cream the mixture until combined. Fold in 1 - cup cool whip and set aside. Prepare pudding according to package directions adding the 2 cups milk. Using a wire whisk, mix the pudding until thickened. When the crust is completely cooled spread on the cream cheese mixture evenly. Add a single layer of sliced bananas. Add the banana cream pudding and spread evenly. Top with remaining cool whip. Sprinkle the crushed vanilla wafers evenly over the top. Be sure to seal all edges. Chill for at least 2 - 3 hours before serving. Cook's Note: Pecans can be omitted if you have a nut allergy or just prefer a plain shortbread crust. We always make this with pistachio pudding. My husband's family calls it Pistachio Tarts. My family calls it four layer dessert. Either way, its yummy. I'm not sure how I found your blog, but I sure am glad I did! 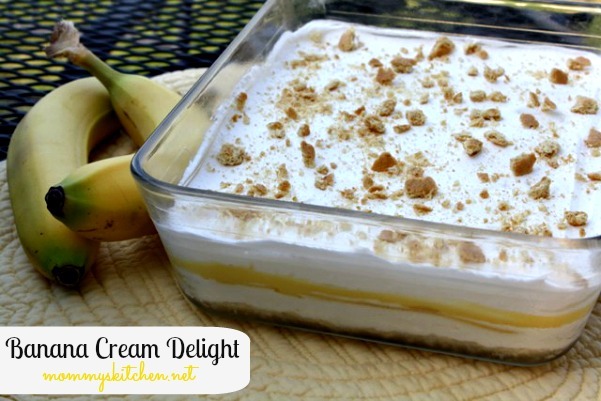 I made your Banana Cream Delight and it was delicious! I'll have to check out more of your site and see what other recipes I can try. Keep up the good work! You now have one more follower! I have made this for years with good success. Every time my step son had something to do at school which involved food, he would ask for what we called "four layer dessert. I appreciate these new varieties. I've made this in chocolate also! It's delicious!